It's the first day of sneak peeks for the October release from Taylored Expressions! It's time to start thinking Christmas and we have so many fun products to help you with your Christmas list! Everything you see in the next four days of sneak peeks will be available on Thursday, October 5th. Be sure to check out each of the creative team members' blogs for all of the sneak peeks - starting with the Taylored Expressions blog. I named this post "O Christmas Tree" because I have two very different styles of Christmas tree products to show you. First, here's a shaker tree which is so easy to make with the new Christmas Tree Shaker dies. To do this I cut 3/8" off the right and adhered a strip of paper on the inside so it shows through. 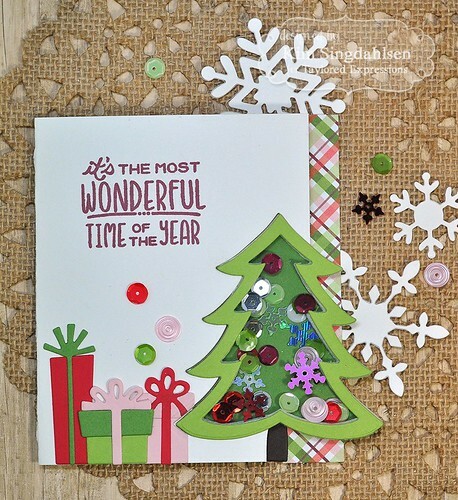 Then I used the larger tree die to cut a piece out of the front of the card. As long as I glued the finished shaker right in that same spot - the card still opens!! The presents are from the previously released All Wrapped Up die set. The sentiment is new. It's from the new Santa & Friends which other team members are sneak peeking more completely. I so love that sentiment that I had to use it. 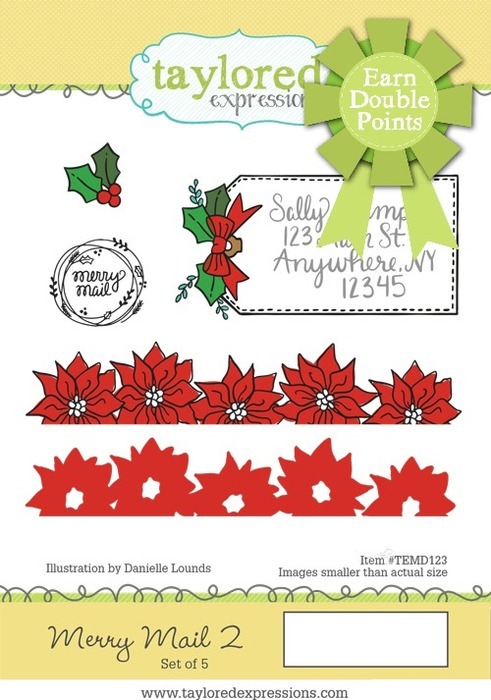 For a limited time, earn DOUBLE CRAFTY POINTS on our Merry Mail 1 and Merry Mail 2 stamp sets! 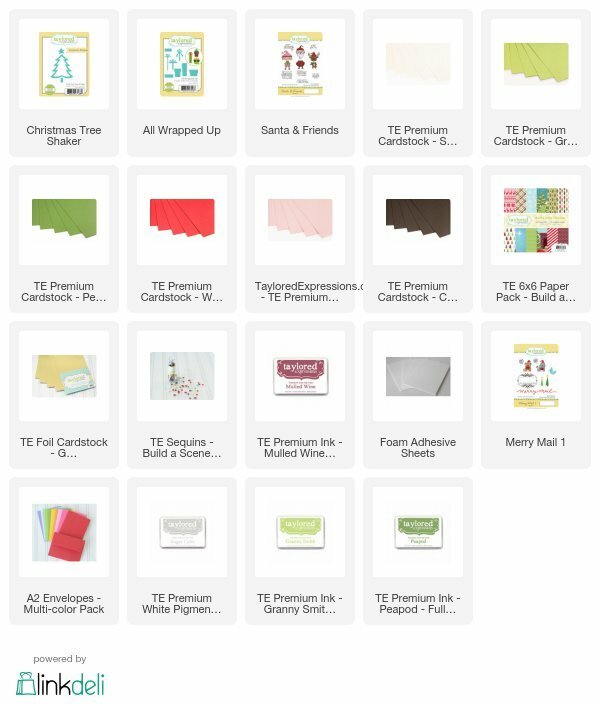 If you're not a Crafty Points member, it's free and easy to join. Just create an account at the TE webstore and you're automatically enrolled to begin earning crafty points with every purchase. 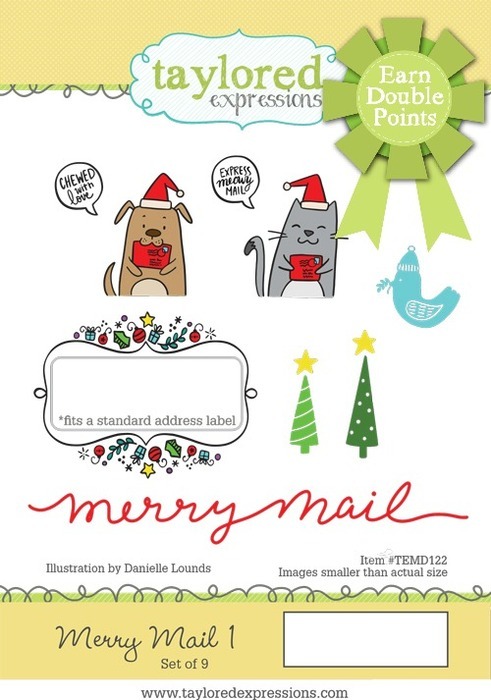 You'll earn 34 Crafty Points EACH on the purchase of our Merry Mail 1 and Merry Mail 2 stamp sets! Offer valid on qualifying purchases made between 9am CST on Thursday, October 5, 2017 and 11:59 pm CST on Sunday, October 8, 2017 and only while supplies last. Crafty Points are only available on purchases made via our retail site: www.tayloredexpressions.com. Here's the supply list for this card and be sure to keep reading for a chance at prizes and for another sneak peek. 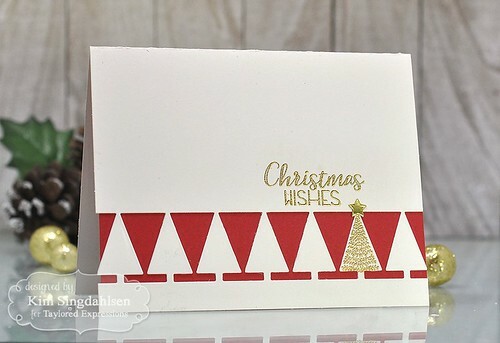 Now I have a different type of Christmas tree using the Block Party - Christmas Trees which simply cuts a row of trees across the card - but is made extra special by the trees in the Spirit of Christmas stamp set that are sized to fit these trees. 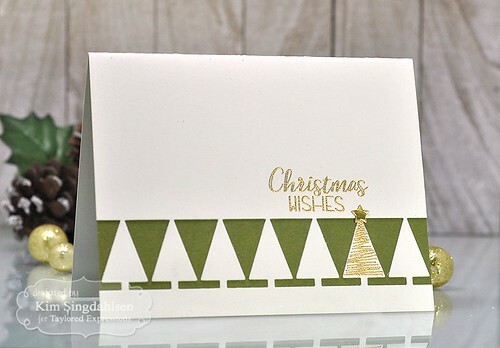 This is such a quick and easy card and so easy to mass produce. I simply gold embossed the tree and the sentiment and added a shiny star. I also wanted to try a red version. I used different trees and I had planned on using different sentiments from the set but I liked the way this one wrapped around the star. Did you notice the star?? It's cut from the new Gold Foil Cardstock (it also comes in silver). I used the star from Christmas Tree Stacklets which is the die set that matches all the different sizes of trees in Spirit of Christmas. 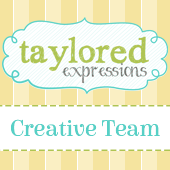 Be sure to visit the Taylored Expressions blog because there's a chance at prizes just for leaving a comment!! Then come back and visit all of us tomorrow. My cards are at both ends of the spectrum - another quick and easy card with using a snowflake background - and I have a very detailed nativity card. Kim these are fantastic! I really love how you used the shaker on your first card and offset it off the side of the card with the cut out open flap. That's brilliant! 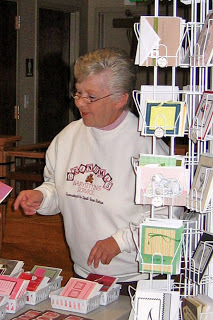 I like the fun shaker tree and the way you've let it flow off the edge of your card! This is festive and cute Kim. The others are CAS modern funky fun! Fantastic sample projects, Kim! Love the new stamp sets for decorating envelopes!!!! 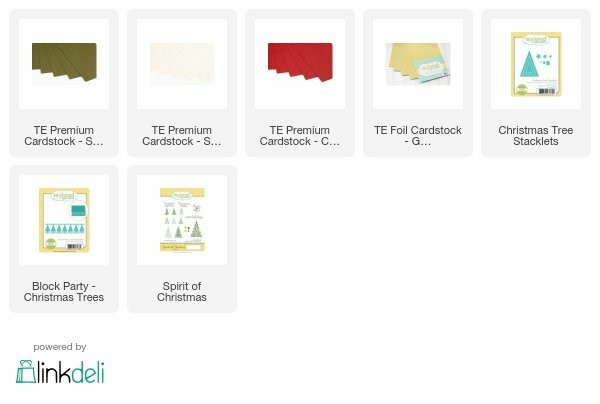 And I didn’t know TE sold envelopes, so I’m definitely going to need to get some of those!!! 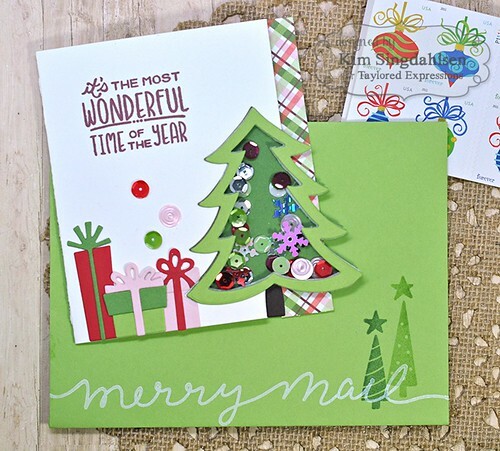 And those Block Party Trees with the coordinating stamps— LOVE!! !